The Business Architecture Framework has become virtually the world standard for expressing and laying out the framework for business architecture and has the tools every business architect needs. It consists of a two dimensional classification model based on the intersection of six communication questions (What, Where, When, Why, Who and How) with two models defining the two characteristics of interest to the business- architecture models and business relationship models. The strong point of this Framework is that it represents the only complete, non-redundant, and detailed coverage of an organization. Business architecture, defined in terms of this Framework, leads to the acknowledgement that there is more to an organization than mere data and processes. There are numerous other issues, multiple locations and timing factors to consider while planning its development. All frameworks have the goal of outlining a structure which can represent the complex interactions between people, processes and technology. We define how to organize the structures and components within an architecture - capturing all business architecture standards. This may be used to describe current, future and gap analysis states of an organization. 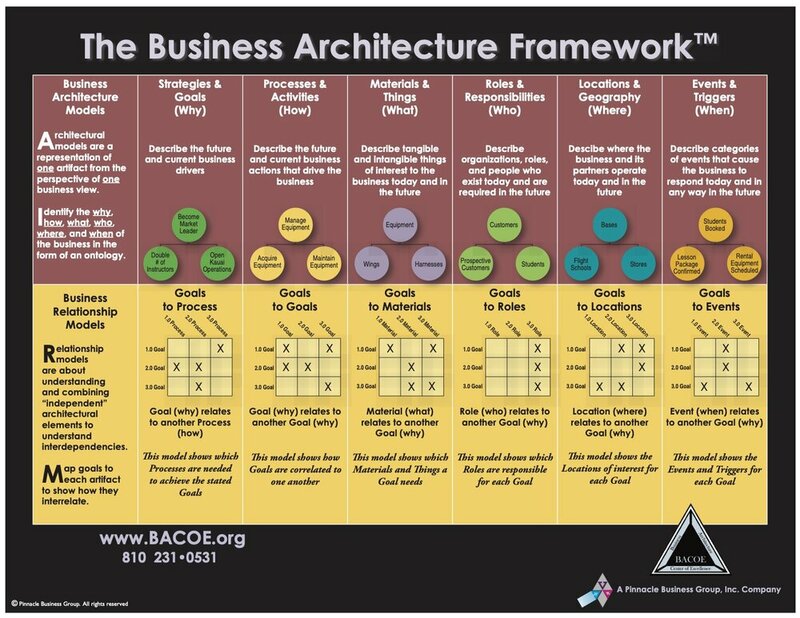 The BACOE Business Architecture Framework organizes architecture into different “views” that make sense to different stakeholders. Thus, views are the different complementary projections of the enterprise model. The “views” based approach of architecture frameworks is good in less complex, small-scale scenarios. Visit our Guest Content page to download a PDF of the Business Architecture Framework.